As efforts to save the spotted owl seem to be failing, the government is getting ready to try some experimental forestry to keep the species alive. Apparently the scientific approach is to hunt down the owl's competition and let the loggers in. In other words: There are some hard times ahead for the barred owl. 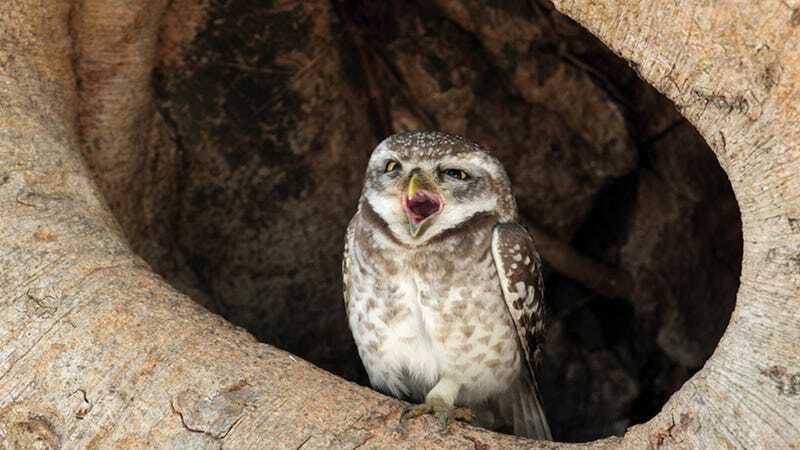 The spotted owl is as close as you can get to an emblem for environmental conservation, which is why the plan to "save" the owl is all the more shocking. According to Science Magazine, the U.S. Fish and Wildlife Service is resorting to some pretty drastic measures to save the owl's dwindling population. The plan calls for doubling the spotted owl's old-growth protected habitat in the Pacific Northwest, which seems to make sense. Then the plan gets aggro. In a change from current policies, FWS will encourage so-called active management of owl habitat, such as thinning forests that face a high risk of burning. A Presidential Memorandum released today directs the agency to clearly inform timber companies and landowners how they will be able to log critical habitat. "The science is telling us that unmanaged, fire-prone forests aren't healthy for either the landscape or the spotted owl," said FWS director Daniel Ashe at the teleconference. The FWS says it's just using science, but no amount of science is going to convince environmentalists. But what's really got them up in arms is the FWS' decision to start picking off the spotted owl's competition. Part of the new management plan calls for barred owls to be removed by either "relocating or shooting them."